It is August, so it’s no real surprise that it’s exceptionally hot outside. But maybe because we’d gotten lucky with comparatively milder summers for a few years, this summer has seemed really, really hot. In the middle of another triple-digit day, I have to wonder why I don’t own popsicle molds? I must have convinced myself that I wouldn’t use them very often, but right now they seem like an obvious necessity. I started pondering this kitchen tool question when I read about these yogurt pops in the July/August issue of Clean Eating magazine. They’re presented as one of three frozen breakfast pop options, and I was delighted with the ingredient list and its lack of refined sugar. They’re made with plain yogurt, natural peanut butter, cocoa powder, and a little maple syrup. I wanted to pull out the blender and get right to work. I had some paper cups that I could use to freeze the pops, and I just needed some popsicle sticks. And, that’s when I learned that I would have to go to a craft store to get popsicle sticks because the grocery stores where I looked didn’t have them. That should have been a sign that I need to just get popsicle molds. 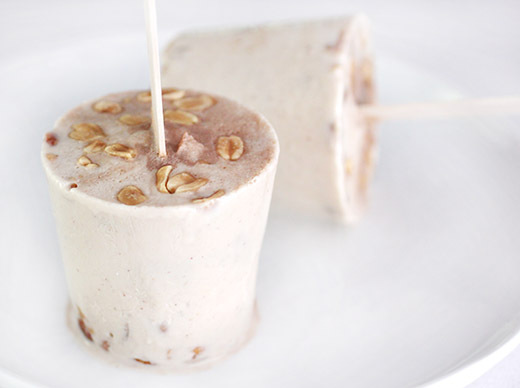 I pushed onward, found some sticks, readied the paper cups, and made the yogurt pops without molds. First, I toasted some unsalted organic peanuts and added salt. Next, a banana, some plain Greek yogurt, unsweetened almond milk, natural peanut butter, and maple syrup were pureed in the blender. 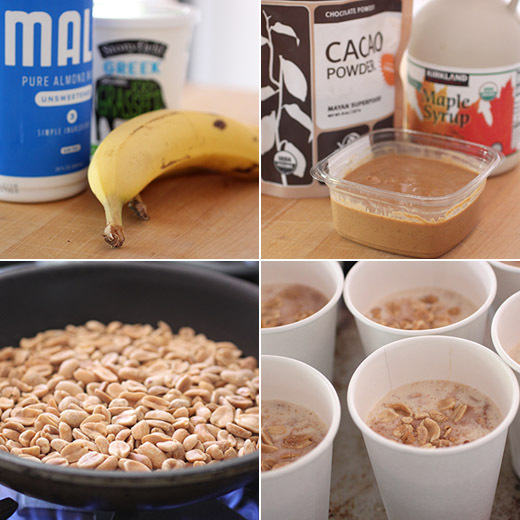 Some of the peanuts were added to the cups, and half of the mixture in the blender was poured over the peanuts in the cups. Back on the blender base, cocoa powder was added and mixed into the remaining yogurt mixture. The chocolate mixture was added to the cups, and more peanuts were sprinkled on top. Additional peanut butter is also suggested, but I skipped that and just added peanuts. I appreciated the simplicity of this recipe, but if you’d like a truly layered look it would require a little more time. To get layers, the first addition of yogurt mixture in the cups would need to be frozen until set before the chocolate mixture is added. Without that added step, you get a swirly result. 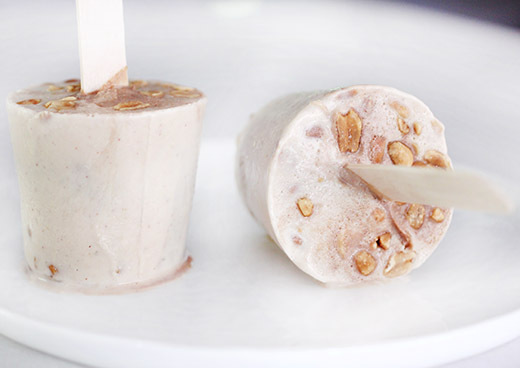 Also, since I was new to popsicles, I didn’t realize the mixture needs to freeze and set a bit before you place a stick in the center of each cup, or the stick will just fall to the side. I feel like I learned some good lessons in the realm of popsicle science here. And, I got to enjoy some delicious frozen treats. The salty, crunchy peanuts were a delightful contrast to the ice-cold, creamy frozen yogurt, and I always love the mix of banana, chocolate, and peanut butter. What’s your opinion on whether popsicle molds are a kitchen necessity, and if you have some which kind do you recommend? When I cooked these dishes a few weeks ago and posted a photo on Instagram, I mentioned that I love cooking from Madhur Jaffrey’s Vegetarian India: A Journey Through the Best of Indian Home Cooking with summer produce. There are so many great recipes that include eggplant, tomatoes, and okra that I’m still working through all the pages I’ve marked with little sticky flags. But, today I started wondering why I associate the book so much with summer produce. As I flipped through the pages again, I started getting excited for late fall and winter produce to make things like the Spicy Cauliflower Omelets and Vegetable Biryani with Cauliflower, Carrots, and Peas. I also usually enjoy comforting, slow-cooked dals more in cooler weather, and there are several good ones in the book. But for now, we have lots of local eggplant to eat. At Boggy Creak Farm, they’re growing a green variety this year called Daesene Green. They’re also growing lovely, green okra. 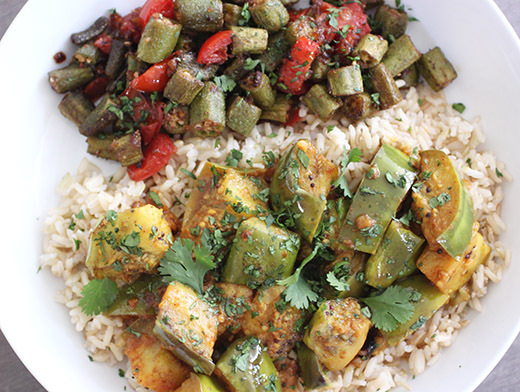 In the book, the recipes are called Rice with Eggplant (Vangi Bhaat) and My Everyday Okra (Roz Ki Bhindi). I decided to serve the two together since I had brought home both of these stars of our local, summer vegetable options. First, the eggplant was cut into big chunks. I was tempted to make the pieces a little smaller, but I’m glad I followed the instructions. Given the length of time the eggplant cooks, the chunks become delightfully tender. Smaller pieces would have turned to mush. The big chunks were soaked in water while oil was heated in a large saute pan. A cinnamon stick, mustard seeds, and dried red chiles were added to the hot oil and stirred until the seeds began to pop. Onion was added next and fried for a minute. Next, the eggplant was drained and added to the pan with some salt. The eggplant was fried while stirring for about 10 minutes until well coated with the spices. Ground coriander, cumin, turmeric, and chile powder were added next and cooked for a couple of minutes. Then, lemon juice, tomato puree, and water were stirred into the mixture, and it was left to braise, covered, over low heat for 20 minutes. It was to be served over rice, and I used brown basmati. 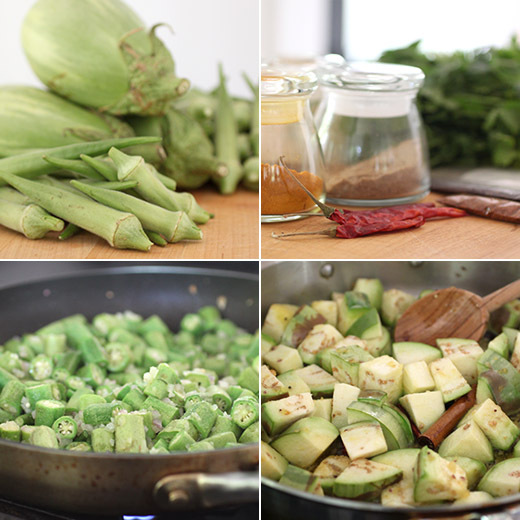 For the okra dish, the pods were cut into pieces and cooked in oil with minced onion. The heat was gradually decreased as the okra cooked. Ground coriander and cumin were added with chile powder, amchoor, and salt. Chopped tomatoes were added and left to cook for just a few minutes more. Meltingly tender is the perfect description of the eggplant in this dish. I would even call it buttery. It was addictively good. The dried chiles and chile powder gave it a nice level spiciness. 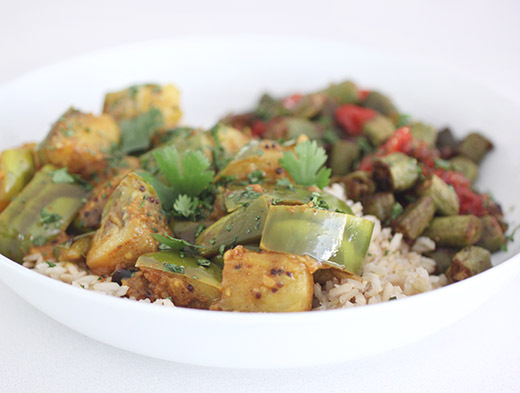 Okra and tomatoes is common in the South, but this Indian version delivered a lot more flavor. These recipes made great use of summer vegetables, and now I can’t wait to revisit this book more often in cooler seasons. I started reading my review copy of Edward Lee’s Buttermilk Graffiti: A Chef’s Journey to Discover America’s New Melting-Pot Cuisine back in late May. One of my first thoughts about the book was that it reminded me a little of Anthony Bourdain’s style of explaining the uniqueness of a place through the food. For this book Edward Lee visited different cities around the US, but what the reader learns from him of those places is not the typical or expected or most common thing about each place. He set out to find stories of food made by immigrants and how those dishes have become American food. There may be interpretations of dishes from home countries or an evolution of dishes over time, but the priority here is to tell the story behind the food and appreciate it for what it has become. Each chapter ends with a recipe or two or three that are Lee’s take on a dish or dishes particular to a place. His story about Lowell, Massachusetts starts with the town’s tradition of boxing but leads to the Cambodian immigrants that now make up 40% of the local population. The recipes include Amok Trey which is a coconut curry with fish that’s cooked in a banana leaf and a Pork Lab with Fried Egg on Popcorn Bread to mimic hash on toast. It was interesting to learn of the Lebanese food traditions in Clarksdale, Mississippi where kibbeh is common and the Chinese buffet restaurant serves sushi and lo mein alongside fried chicken, lima beans, and cornbread. Patterson, New Jersey offered another intriguing story where you’ll find “the largest concentration of Peruvian restaurants in the country” due to immigrants from Peru who came to this city for factory jobs. Lee points out that “the food of immigrants is not authentic but frozen in time, reflecting the culinary moment when the immigrants left their home.” It’s also dependent on what ingredients can be found in the current location. Tastes and customs change dishes in home countries and abroad, and what results is no less traditional just different. The recipes for this chapter include Pollo a la Brasa which is a slow-smoked, marinated chicken and Green Fried Rice with Chicken, Cilantro, and Aji Sauce. The question of why German cuisine isn’t more championed was brought up in a chapter about Wisconsin in which Lee and his wife visited several German restaurants and food shops. It’s a good question. This is the one type of cuisine for which I can’t think of a well-known cookbook devoted to it. But, I was delighted to see a unique spin on schnitzel with the recipe for Roast Butternut Squash Schnitzel with Squash Kraut. And, now I need to explain a little about our local, Austin food scene. Our seasons don’t always align with those of other parts of the country. While some area farms continue to have butternut and other hard squashes through the fall, our urban farms tend to have them early in June. I learned that’s due to insects that attack the plants when they’re planted later in the summer. The plants do fine when planted early but won’t survive the summer bugs. 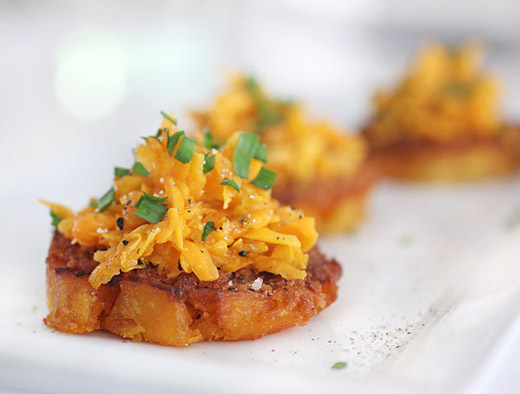 So, I was able to get lovely, local butternut squash to make this dish well before fall. First, the butternut squash kraut was started since it needed a few days to naturally ferment. 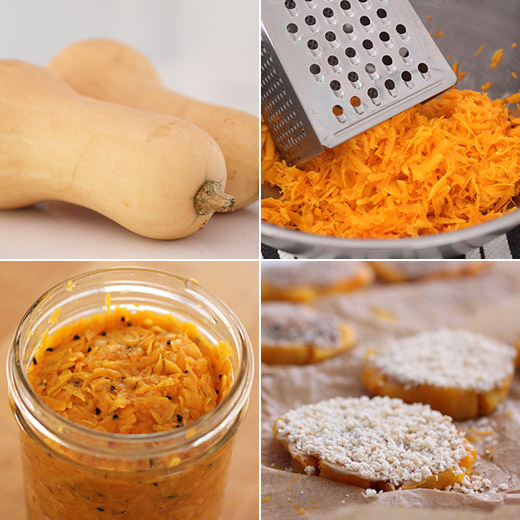 The squash was grated and combined with minced onion, garlic, salt, and caraway seeds. I was sure I had caraway seeds to use for this, but when I searched through my spices there were none to be found. Instead, I used nigella seeds which are also sometimes called black caraway so they’re not too weird of a choice. The squash and other ingredients were mixed by hand in a bowl and squeezed to get some juices extracting. The mixture with all the juices was then placed in a jar, water was added, and I weighted down the mixture with a smaller jar. It was left at room temperature for 48 hours and was then refrigerated for a few days. It can be kept for a month or so. For the schnitzel, butternut squash was peeled, seeded and roasted until somewhat tender. When cool, rounds were cut and pressed to flatten a little. Then, I made a little change to the recipe. Rather than breading the squash with flour, egg, and breadcrumbs, I took a simpler route. I spread the tops with Dijon mustard and pressed on breadcrumbs. I do this often with fish for a simpler breading technique. Also, the recipe in the book includes a mustard-cream sauce which I skipped to make it a little lighter and because the mustard flavor was already present. 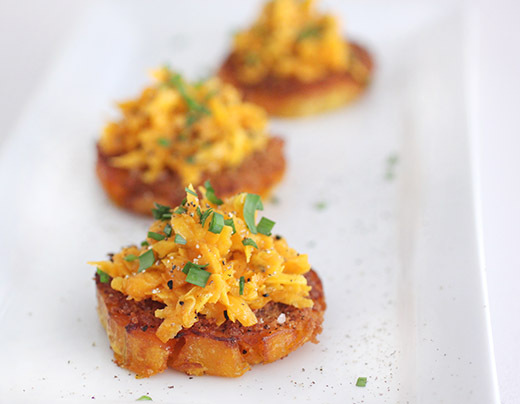 The breaded squash slices were fried in olive oil until crispy and served topped with the squash kraut. In Texas, the most common evolution of schnitzel is chicken-fried steak which for the uninitiated is a pounded-thin slice of beef that’s breaded and fried and topped with cream gravy. Since I don’t eat red meat, I was thrilled to see this vegetarian schnitzel concept. Oddly, the process of slicing and flattening the squash pieces reminded me of making tostones. I love it when food traditions cross boundaries like that. So does Edward Lee, and he encourages readers to take these recipes and make them their own. There’s a lot to learn and experiment with here.